We are finally sharing a house update! I know it’s been awhile, but I didn’t think you would be interested in seeing a bunch of boring dry wall pictures. 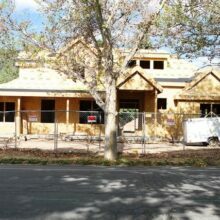 Well, things are moving along and our house is really taking shape! The finish work is mostly done and we are in LOVE!! I seriously get butterflies every time we go up to our house. It still feels unreal. 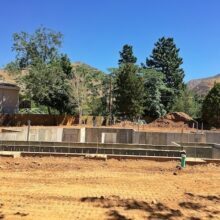 I can’t believe we are really building our dream house! We have been enjoying the process. Several people told us that building a house would ruin our marriage and cause a ton of stress, but we have had so much fun. It’s been an exciting journey. Our builder, Fox Group Construction, is amazing! We have loved working with Tom and his crew! I told Josh I am starting to get sad that our house is almost finished because I don’t want it to end. Sure, I am excited to move in, but I have loved the entire process. 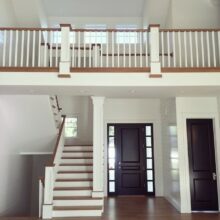 Today, we are sharing some photos from the inside of our new house! Let’s go on a little tour! We love natural light so we put in a lot of Pella windows. The great room windows are our favorite because they collapse and open up to our outdoor patio. We will demonstrate them once the patio is done. They are SO cool and will be perfect for entertaining! 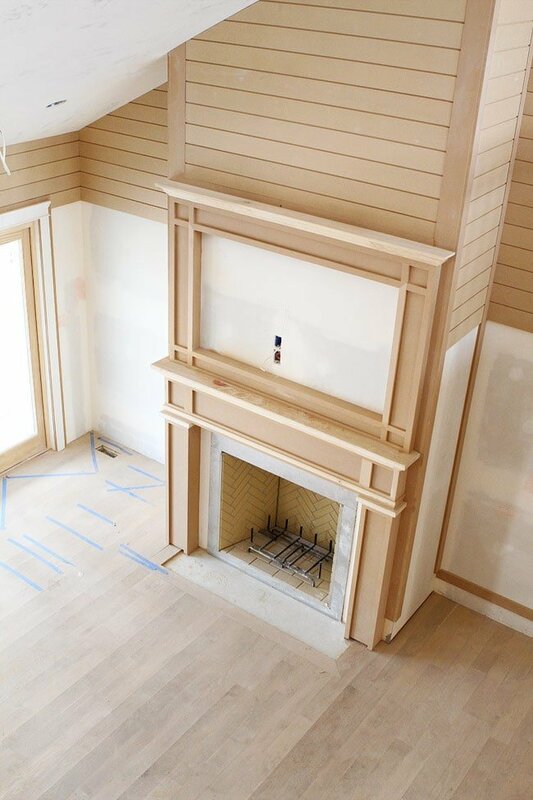 Our builder got a little shiplap happy and we are SO glad because we LOVE it! It’s not even painted yet and it already makes the main area so pretty! 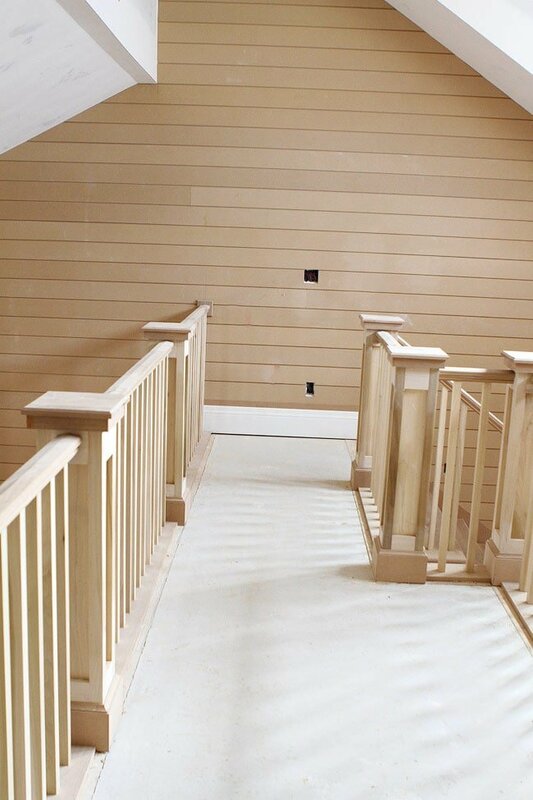 The shiplap goes up the entire staircase! It will be painted white soon! This is our future kitchen. It doesn’t look like much now, but you just wait. We have some grand plans for this area of the house! 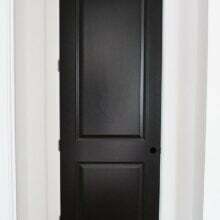 Our back door is a Dutch door from Rejuvenation. One of my requirements for our new house was a Dutch door because I love them! 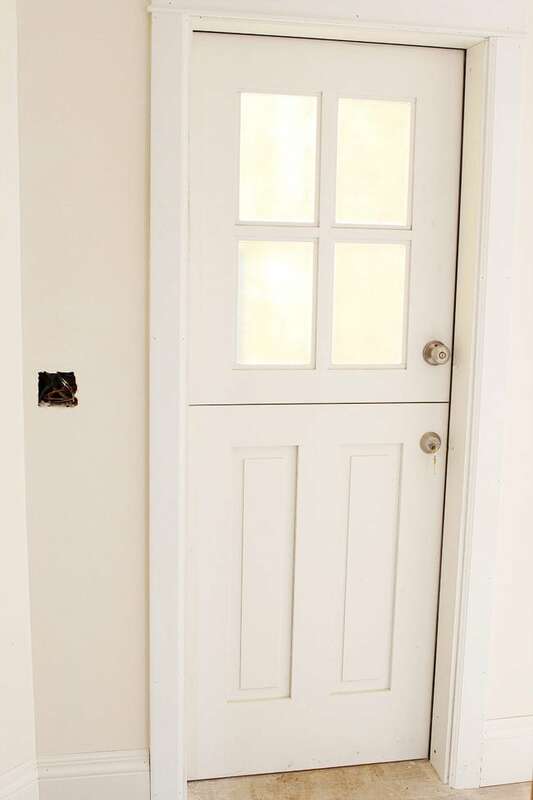 I think the door is so cute and will look even better once it is painted black! 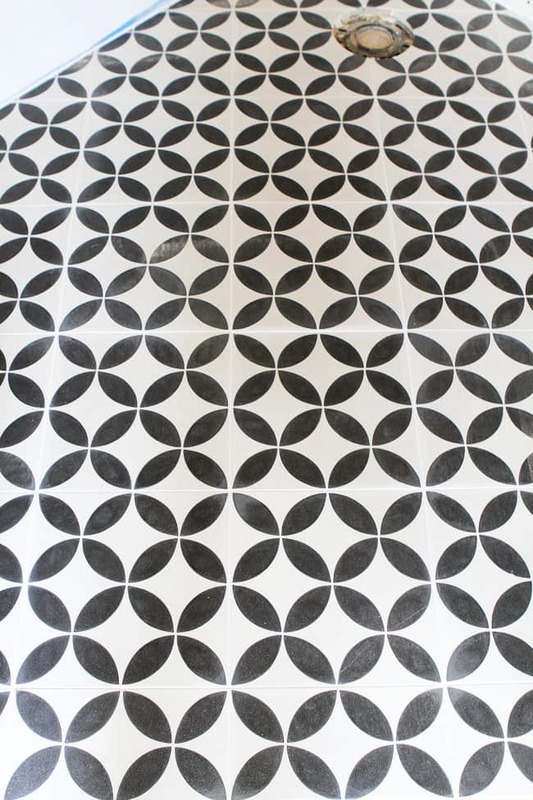 We did a fun black and white Cement Tile in the guest bathroom. Classy and fun! 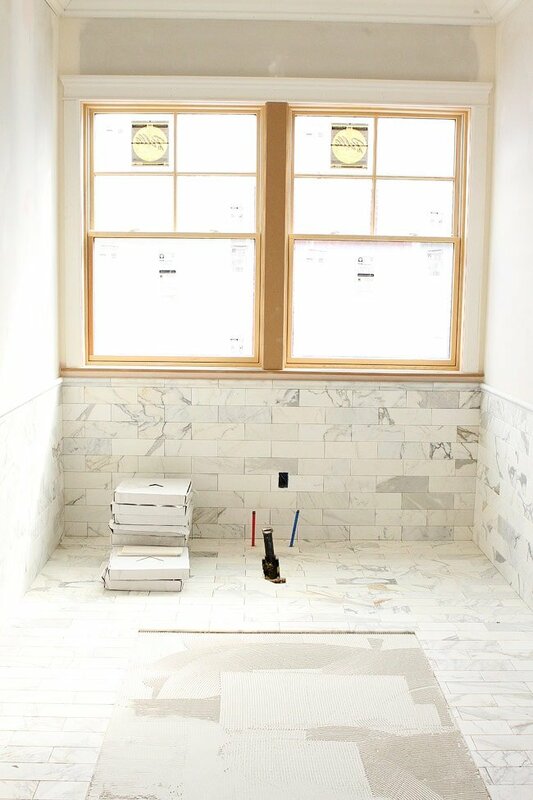 In the master bathroom, we are putting in calacatta gold marble tile from Contempo Tile. It is so pretty! That little corner of the master bathroom will be the home of my freestanding tub! I can’t wait! 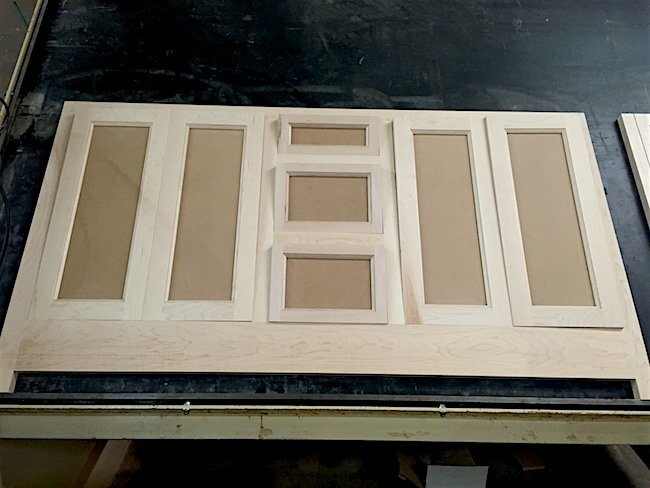 Our cabinets are being built right now by Benjamin Blackwelder Cabinetry. Benjamin does AMAZING work and we are so so so excited for our cabinets! 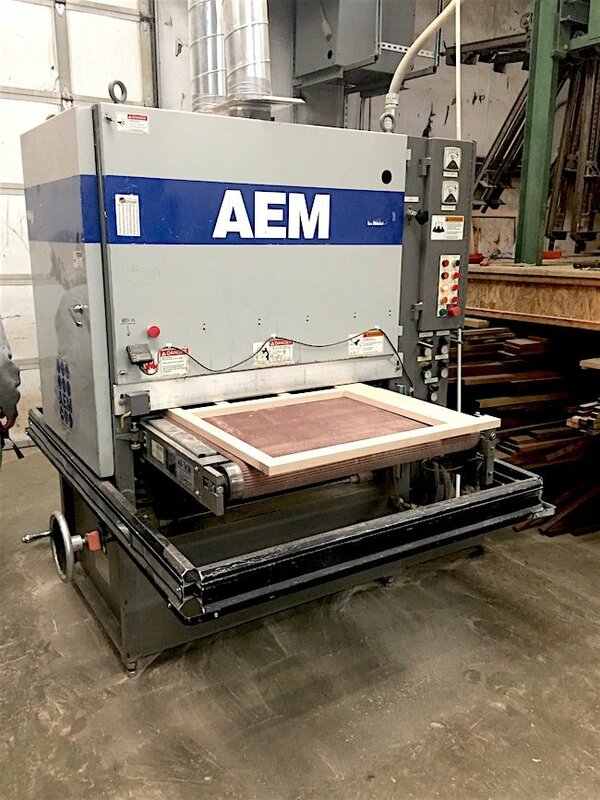 We visited his shop in Alpine, Utah to see the process and we were both blown away! Josh was drooling over the neat equipment. This is the start of our boy’s vanity for their bathroom. I am in love already! 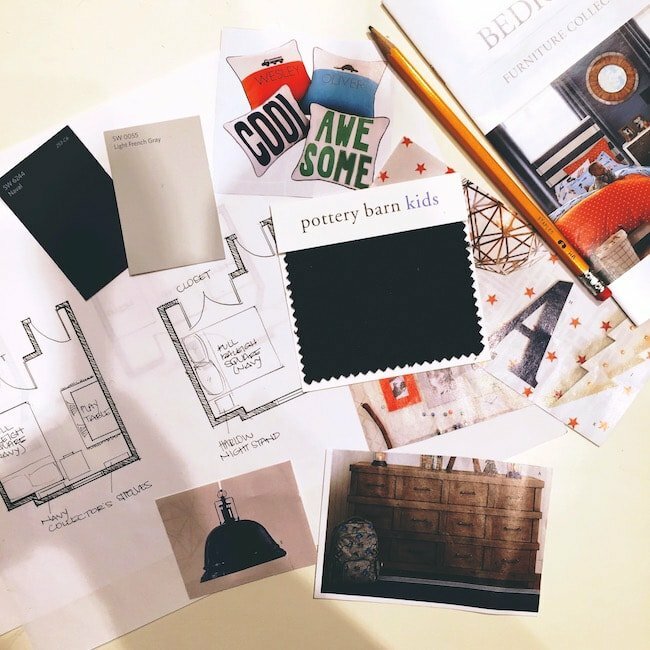 We are working with Pottery Barn Kids to design the boy’s bedrooms. They boys are excited and so are we! Their rooms are going to be super fun! The next step is paint! We will share another update soon! Thanks for going on a house tour with us! Have a great weekend! Thank you! It really has been fun! I LOVE everything about this new house!! So much open space and the LIGHT!! I can’t wait until you guys move in and have all the appliances in so we can see it all together 🙂 it’ll be so much fun! Light was very important to us:) Thanks Julie! I just squealed when I saw what this post was! I am a total design-o-phile and I am so excited for you- looking great! WOW! your house looks spectacular. Congratulations. Thanks for sharing. It’s nice to hear that everything is going well and that you are enjoying the process. Too often all you hear are the horror stories so its nice to hear a good one for a change. I love your recipes they are delicious and everyone thinks I’m a GREAT cook and I owe it all to your recipes. I also love reading your blog and getting to know your beautiful family. You are truly blessed. Thanks so much Lorna! We are glad you are enjoying our site! Love this post! Your house looks perfect! Thanks for sharing! Omg LOVE your front door! Can’t wait to show my husband . This would be a great add on to the new front porch were planning. If he blocks me from your site because of yet ANOTHER add-on to a project I’ll re-sign up LOL! Love the ship lap too-trying to work some in somewhere as we speak! It looks fabulous! I am so jealous – it’s a dream come true! Love it, love it, love it! It really is a dream home and looks fabulous! Please keep the updates coming. Thank you! We will keep the updates coming! Love everything about your new house! Can’t wait for the finished product. Wow! It looks amazing! Can’t wait to see what you do in your bedroom when it’s done and what you do in the boys room. Definitely a dream come true. We are still working on our bedroom! Lots of decisions! Gorgeous!! I’m drooling over all the shiplap!! We will be building our dream house next spring, so I love hearing about your build!! I love the shiplap too! I can’t wait to see it painted! What a wonderful home ! Can’t wait to see how you paint/decorate the boys’ rooms. I am looking for some ideas for our boys’ rooms, as we just moved into our dream home last May. We will do an update soon! The boys are excited!! Love looking at your new house pics, absolutely fabulous, especially that Dutch door, yummo! Yes it’s a very exciting time, sure building is stressful, but so worth it in the end. We built our first house in 1981 and I remember saying at the time ‘Never again’. Twenty three yrs later, we sold the house in order to downsize and think about where we wanted to live. I did say recently that perhaps there might be one more build (somewhere coastal ) left in me before the kids want to ship me off to ‘Shady Pines’ Nursing Home! That raised a few eyebrows! May your new house bring you a lifetime of wonderful memories! Dying to see the house when it’s finished and you have added your decorating touches to it. Good Luck. I am super excited for our Dutch door! Thank you so much! We are excited for our home, especially to share it with family and friends! Love this update!! We just finished a small living room makeover, and added shiplap to our main fireplace wall. It’s such a fun detail, and adds so much character to a room. I can’t wait to see the dutch door painted and everything else come together. Thanks so much for sharing! Shiplap really adds to a space! I bet your fireplace looks great! We are building our house so we can entertain and have lots of people come visit! Your house is absolutely beautiful. Thank you for sharing all the pictures! 🙂 We moved into a brand new house last year around this time, and I am still always looking for decor and style ideas. I also want to thank you for all the hard work that you put into creating and sharing your recipes. I am a huge fan! Have a wonderful weekend. the shiplap is pretty amazing. I can wait to see it all painted!! 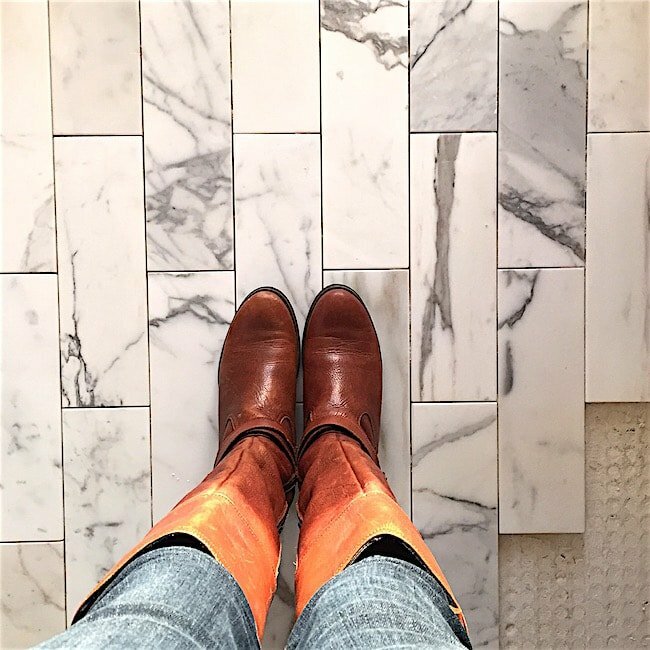 OMG that marble tile is STUNNING. Can’t wait to see the finished product! I love that marble too! It is turning out great! Oh, yay! I’m glad you guys are having a good time! I was prepared for a fist fight when my husb and I went house shopping a few years ago, but we ended up finding it on our first day and agreeing completely that it was the one. Yours is going to be a beauty when it’s done. 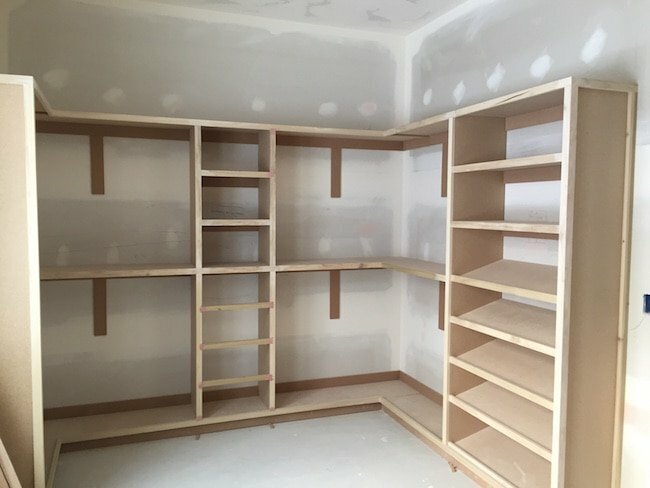 Our builder is amazing so it’s been a fun process for us! Wow Maria – the house looks awesome. I am so excited and happy for you two. I don’t think I could do it but I’d love someone else to do it for me. I can not wait to see your dream kitchen finished. And I love those Pella doors in your great room! Thank you for sharing the pictures of your beautiful new home. Best of luck! We are SO happy we hired Fox Group Construction! It has mad the process FUN! LOVE all you’ve shown, Maria!! Can’t wait to see more as you go! You all will be so happy there, I’m sure! Congrats! I’ve loved watching your family grow and am excited for you to be building your dream house! Thanks for sharing it…. I love watching the building process! Keep the pictures coming! Thanks Chris! I am excited for the kitchen too! I canNOT wait to see the after pictures once it is done! It is already stunning – can I move in? HA! YES! Please move in…or at least visit us soon! Your home is going to be beautiful. Thanks for sharing. Your house looks amazing! I love it! I’m so happy to have pictures to share now instead of just describing every area. It’s sooo fun to watch it take shape and become a reality!!! You better come visit when it’s done! I was so stressed when we built our house eons ago but I’m glad you’re having a good time with it. I’m sure you’ll love it when it’s finished. Well, OK, Maria, love your house tour, totally get why you’re excited!!! Also love the pic of Josh, the kids & you; so fun hanging out with you on the slopes today. Thanks Helen! I am so happy we met. Thanks for a fun morning on the slopes! 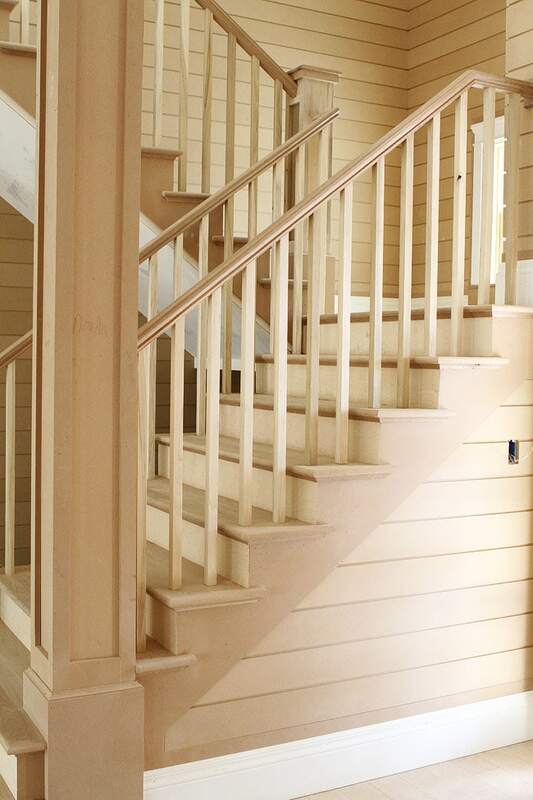 What a dreamy house…can’t wait to see how everything turns out when it’s finished!! I can’t wait to see your amazing kitchen too! Happy building! I love seeing the house progress. Thanks for sharing. When I saw the shiplap, all I could thing of was Joanna Gaines on HGTV”s Fixer Upper. She adores shiplap and what she and her husband Chip do in their rennovations is outstanding. I live in N.E. and shiplap is not a material used inhouses but I think it should be. 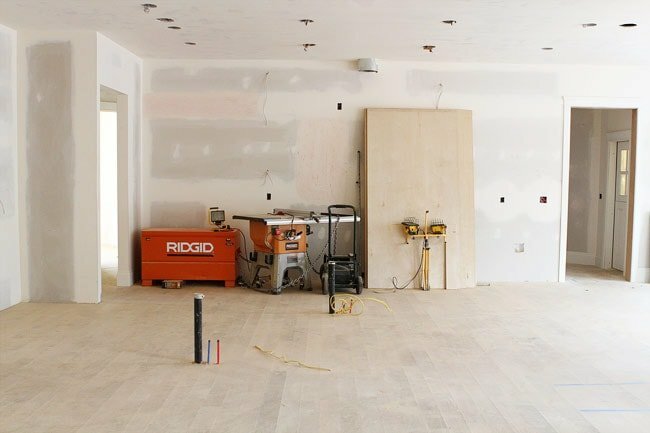 I can’t wait to see the finished kitchen and baths…actualy the finished everything! Again, thanks for sharing with your readers. Fixer Upper is my favorite show! Love Joanna’s style! Oh my goodness, it looks AMAZING!! I love all the shiplap! Can’t wait to see it finished. So excited for you! OMW! What a gorgeous house! If we were to ever design our own home, which I swear we’ll never do as I’d go mad, I will ask you to do it for us. Your taste is incredible. There’s nothing here I don’t like! I know what I like but have no clue how to pull it all together. Ha! Thanks! It has been fun to start from scratch! WOW! 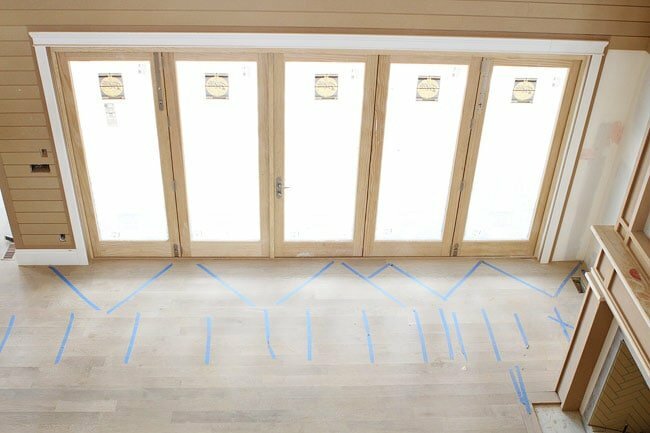 How much fun you will have in your custom home and I LOVE the shiplap. I wish my kitchen were as big as yours is going to be. Making a home can be trying at times but, living in your new home make memories and sharing life makes it all worth it. Thank you for sharing your home with us. You are welcome! We are having a good time! It is looking amazing! It is definitely going to need some family pics on those gorgeous walls!! Can’t wait to see it in person! We already have some great ones, but we will have to take some new ones too! Come see it soon! Oh my GOSH. Can I move in? I love to iron! And I’ll do laundry 😉 And help with the adorable boys! Seriously beautiful, Maria and Josh. 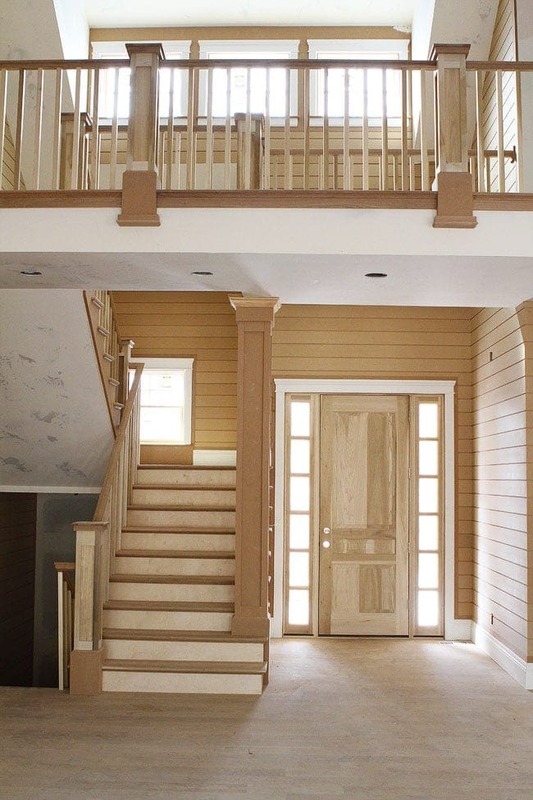 You could leave all that beautiful woodwork unpainted and I would still think it is perfect. OK, talk about my dream house. Everything looks amazing! That guest bath tile is my favorite. And those huge windows! I love that tile too! So fun! I love the doors and windows you selected and hope to replace our Pella windows soon as well. We’re kindred spirits – we recently added tongue and groove cedar, much like your shiplap and are getting ready to replace our front door with a dutch door as well! I cannot wait to see your completed home. It’s absolutely beautiful so far! Congratulations! Julie-thanks so much! That means a lot coming from you because I LOVE your style! I love this so much…I’m coming to visit soon!! Thanks so much for sharing your new house, soon to become your new home, with us. Charlie and I will be out to visit as soon as we get invited. God bless you all! The bones of your new house look wonderful! Personally, I think it was huge fun building a house, and being able to do what YOU want makes it even more exciting! Glad to see you’re putting in plenty of outlets, too! You can never have enough electrical outlets, lol! You choose black and white Cement Tile in the guest bathroom is very nice. I love this . The closet is master. This is gorgeous. All of the natural lighting is beautiful!